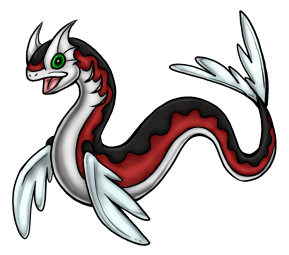 Its base genome was supplied by a rare and elusive serpentine Kreature that lives in deep, cold, freshwater lakes. This makes it expensive to mass produce, since nucleus samples are hard to come by. It has watertight, shimmering scales which not only allow it to survive on land, but also confuse its opponents with mirages that distort its appearance. Its primary ranged weapon is a powerful jet of steam that can scald its opponents. It seizes prey with its long, muscular body and then inhales it a fraction of a second. The meal is torn apart on its way down by a set of inner jaws hidden inside its throat.